Last minute plans are nothing new, so your skin care regimen should be conducive to every man’s on the go lifestyle. Long gone are the days of lathering up with the same bar of soap used on the mentionables that shall go without mention. While the options on the market range from local pharmacy-brand skincare to small tubes of organic ointment that would require taking out a second mortgage to afford. Don’t be intimidated but don’t grab the first thing off the shelf either. Here are a few tips for a quick, effective, and reasonably priced skin care regimen that is a fine fit for every fellow. Before you shave it is important to soften stubborn stubble with a cleansing your face and exfoliating (two to three times a week). Generally men have large pores and sebaceous glands that can leave you looking like you washed your face with fried chicken (which is never a good look). While cleansing is a necessity, it is sometimes not enough; exfoliating a few times a week will help remove debris that a daily face wash might miss. Choose a face wash that will cut through the oily mess you may be dealing with and an exfoliant that contains granules which will help smooth your skin and alleviate clogged pores. priced, highly rated facial cleanser to consider would be Purity Made Simple by Philosophy which is sold in 3oz to 24oz bottles, (*Est. Cost $10-$40). Philosophy Purity Made Simple is a ph-balanced formula that rapidly dissolves dirt deep cleans pores. Purity Made Simple is one of Sephora’s best-selling cleansers and contains infusions of sage, chamomile, and carrot. Men can be found in 4oz and 8oz bottles (*Est. Cost $20 to $35). When it comes to the choice of manual razor reviews by newspapers, magazines and online surveys show an even split between the Gillette Fusion (*Est. Cost $11), $3 each for replacement cartridges and the Gillette Mach3 Turbo (*Est. Cost $10 for razor), $2 apiece for replacement cartridges. What is most likely obvious to most but cannot go without mentioning is do not dry shave! Of course if you enjoy the feeling of shearing off your skin and the cuts, nicks, and unpleasant razor burn left behind from dry shaving have at it. For those, however, that know that a little lubrication goes a long way will find any shave cream, gel, or oil will do the trick. Simply remember to shave with the grain following the flow of the hair and things will go smoothly. your fresh face. 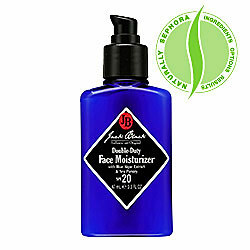 Consider Jack Black’s Double Duty Face Moisturizer with SPF 20 (*Est. Cost $26) which will provide lasting hydration without adding oiliness. Double Duty Face Moisturizer is made from natural ingredients to help visibly improve skin’s overall appearance with UVA and UVB protection plus potent antioxidants help shield skin from premature aging due to sun exposure. These are only a few suggestions on reasonably priced products and steps that any man can use and integrate into his daily regime. There are, of course, other suggestions to be made, such as under eye creams, acne treatments, and facial treatments but this will provide a good base to build upon.